Pre-University - prepare for future university and career choices. Winchester College lies just outside the historic walls of Winchester. Founded in 1382, it is one of Britain's leading academic independent schools. The founder went on to set up New College, Oxford. The historic buildings offer a tranquil environment in private secluded grounds. 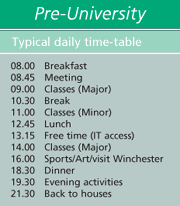 Winchester is 100km south west of London and approximately 1.5 hours by road from London Heathrow and Gatwick. Facilities include a theatre, an outdoor swimming pool, playing fields, cricket pitches and tennis courts. Deliver effective presentations, speaking in English with fluency and confidence. Workshops on e.g. British Culture, Logic & Problem Solving, Presentation Skills. 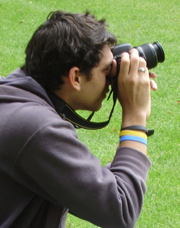 Find out more about each subject on our Majors and Minors pages. 2 excursions per week e.g. Bath (Fashion Museum, Roman Baths), Corfe Castle, London (architectural workshop, West End musical), Oxford (college visit, guided walking tour, punting), Thorpe Park. Spacious, comfortable bedrooms with 1-8 beds and shared bathrooms. 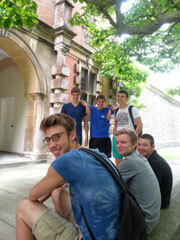 As Winchester is an historic, traditional, boys' school do not expect 5 star accommodation! Airport transfers on published arrival/departure days for flights arriving/departing between 09.00h-15.00h from/to Heathorw airport.